One of the goals that I set myself for this year was to read more historical fiction novels. I love the genre, but haven't had the chance to read nearly enough of them, and I really wanted to find more to read this year. 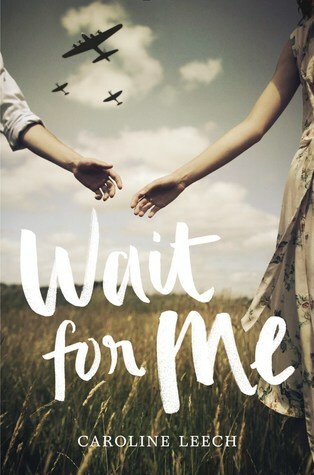 When I discovered Wait for Me by Caroline Leech, which is set during WWII, I couldn't wait to check it out. This book, you guys, it was a really great read. As I mentioned above, the storyline for the book was set during WWII, but the location was set in Scotland, which I found fascinating because all the other books I've read during this time period have been set in London and such. There were some moments throughout the story that had me holding my breath in anticipation, sometimes for good reasons, and sometimes bad. I can't imagine living during that time period, but the author did a great job of describing everything for us. There were so many characters in this book that I really loved, including the main character, Lorna, who was just an awesome young lady. There's also Paul, who you really just can't help but love for all sorts of different reasons. I could seriously go on and on about some of the characters in the novel, but I'd really rather you read the book and discover them yourself! Overall; Wait for Me was such a great read. I seriously didn't want the book to end, and I totally plan to reread it again soon. I'm really looking forward to reading more by this author in the future, and I also can't wait to read some more historical fiction books I have picked out soon. Add this book to your TBR, and read it asap! I'm so happy to hear that you loved this! I really want to read it. Great review!